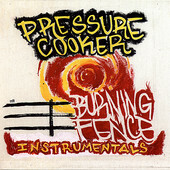 Boston-based 7-piece Pressure Cooker delivers an all-instrumental ska/rocksteady record, their forth record, Burning Fence, a tasty slice of ska heaven. From the constant upbeat that keeps you dancing, through the enticing rhythms, or the jazzy horns, Pressure Cooker keeps things warm and inviting, lighting up the dance floor with glowing grooves, and providing enough of a backdrop to turn even the most unromantic situations into a smoky, vibrant parties. I'll give it a B-.